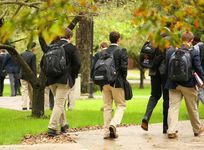 Among "Schools with 200-400 Students", view the boarding schools with the highest average SAT scores (2018-19). For several key reasons (listed below), these comparisons are intended only as informal reference points for evaluating the SAT taking ability of a school's student body. A school's average SAT score is based on a relatively small sample of students from year to year (typically less than 100 students for a graduating class). Average SAT scores, then, can naturally fluctuate year to year while the quality of the overall program and strength of the student body remains consistent. As a final note: average SAT scores should never be used by a family as an expectation of what score they can expect their child to receive if they go to a particular institution. The SAT correlates very closely with the SSAT: Students who have high SSAT scores invariably have high SAT scores and vise versa - SAT scores generally reflect the testing ability of the student prior to being admitted at a school. St. Bernard Preparatory School Photo - The Abbey church is located at the center of campus. The location of the church is no accident, as the rich Benedictine tradition, which spans 1500 years, is central to all facets of the St. Bernard experience. The Winchendon School Photo - Winchendon scores!